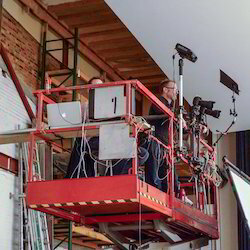 Our product range includes a wide range of double scissor lifts, scissor lift, scissor lift for film shooting, self propelled scissor lift and truck mounted scissor lifts. 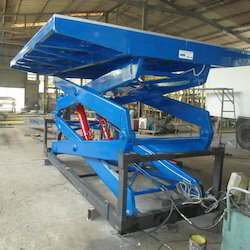 To handle goods that are both heavy and to be reach at specific height you require a lift with special properties, NANDAN's Double Scissor Lift is equipped with a combination of two pairs of scissors to obtain the desired lift range and length to perform the operation, It provides an innovative and cost effective solution for situations where a higher lift height is required. The lifts are typically pit mounted and can be customized for your application. The Mobile Scissor Lift (Towable Scissor Lift) takes the strain out of lifting and lowering heavy/awkward loads. 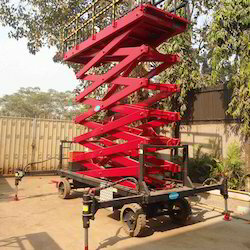 NANDAN's Towable Scissor Lift is used in industry for the access of heights upto 16m and with a capacity of 1000 kg. Solid rubber tires, self-propelled drives and variety of other options make this versatile equipment. Scissor Lift for Film Shooting are portable, hydraulic-powered lifts that are commonly used by industry's to perform maintenance & cleaning work at specific height, Nandan offers Customized Scissor Lifts specially designed for Film Shootings which are useful for film shoots to pan the camera at high angles allow you to shoot movement and action sequences in inaccessible locations to incredible effect. Nandan's Self-Propelled Scissor Lifts are extensively applicable in many areas for high range vertical movement. These lifts provide non-marking rough terrain tires, platform work lights and pothole guards. These products are fabricated by making use of supreme quality required products, procured from the accredited vendors of the industry. Our Self-Propelled Scissor Lifts are constructed robustly to ensure the maximum and reliable performance, easy operation and installation. Nandan makes manlifts / Truck Mounted Scissor Lifts that can service various contours of aircraft. The pantograph scissor mechanism makes it very steady to operate and use. The unit can take payloads upto 2 tons and can go upto heights of 10 m. There can be various configurations of the platform which can be used for engine, tailfin, body access. Many optional and user defined items can be put in to make it more user friendly. 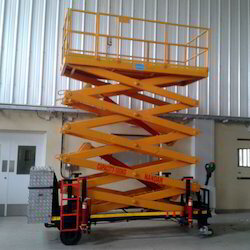 We have manufactured upto 16 m scissor lift with 1 ton capacity or 9 m with 3 ton. The typical used also include tunneling, border roads, street light maintenance, bridge maintenance, etc.